EXCLUSIVE Dazzle them with a winter wonderland of beautiful blooms. 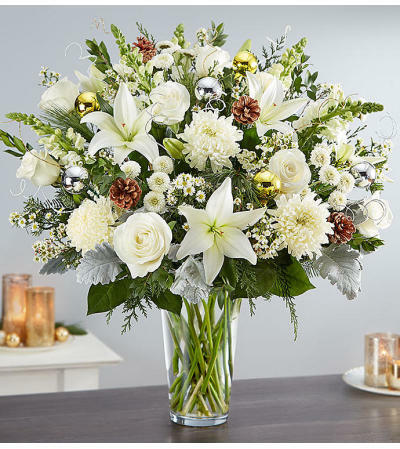 Our luxurious new arrangement captures the beauty of the season in every last detail. Standing almost two feet tall, it’s overflowing with a blizzard of white blooms, shimmering silver & gold ornaments and pinecone accents to play up its natural beauty while adding plenty of texture. What a memorable gift to share during this magical time of year.